COPTRZ recently had the opportunity to speak to Andrew Johnston, Director of Inspection at Innovair. Andrew has over 10 years of experience in the oil and gas industry and is a qualified UAV pilot. He specialises in advanced and remote inspection technology and programme & software development. Drones are becoming an increasingly popular tool used for surveying large areas. With the rapid growth of the industry, drone use is only going to get more frequent, and our interview with Innovair shows you exactly why. Read on for our interview with Andrew Johnston from Innovair, finding out how and why they are using drones. Innovair specialises in the development and operation of innovative and effective industrial robotics systems to overcome complex challenges across many industries. We provide a holistic, accurate and responsive inspection & survey service which captures and analyses data in hard-to-reach areas; ensuring customers are confident in managing risk and achieving the highest operational efficiency through state-of-the-art, tried and tested techniques. We were founded in 2015 by three like-minded Aberdonians. Innovair combines a unique blend of experience honed over a combined 40+ years in the industry. We aim to utilise this multi-disciplined capability to deliver the highest quality inspection and survey services. What drone do you have and how do you use it? We utilise the DJI Matrice 210 Enterprise UAV along with Sony X4S camera for survey work less than 200 hectares in size. Combining UAV Photogrammetry data with land-based ground control points provides a GSD (ground sample distance) of about 1.8cm/pixel. We use a mixture of Propeller Aeropoints and other surveying techniques for ground truth and model scaling. We utilise the M210 in a variety of sectors and it’s great for mid-scale land survey projects such as quarries or construction sites. What are the services the M21O provides for Innovair? In a lot of projects, we have to be reactive to our clients. The phone may ring in the morning for an unplanned survey. With the flexibility of the M210 system, it allows us to make last minute projects like these happen. 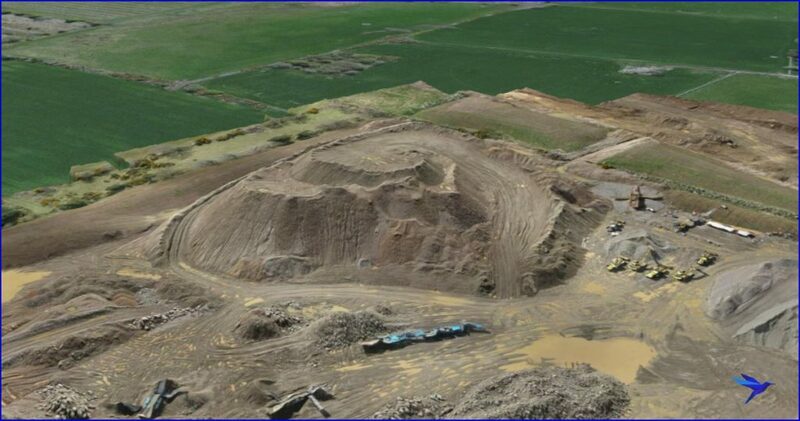 Traditional ground-based techniques in sites such as quarries of up to 100 hectares in size were currently being utilised to survey the stockpiles monthly. However, these were taking 7 days to complete and involved an increased risk with survey personnel exposed to heavy vehicle movements. Additionally, due to a large amount of material, traditional methods could not meet the accuracy standards that we required. 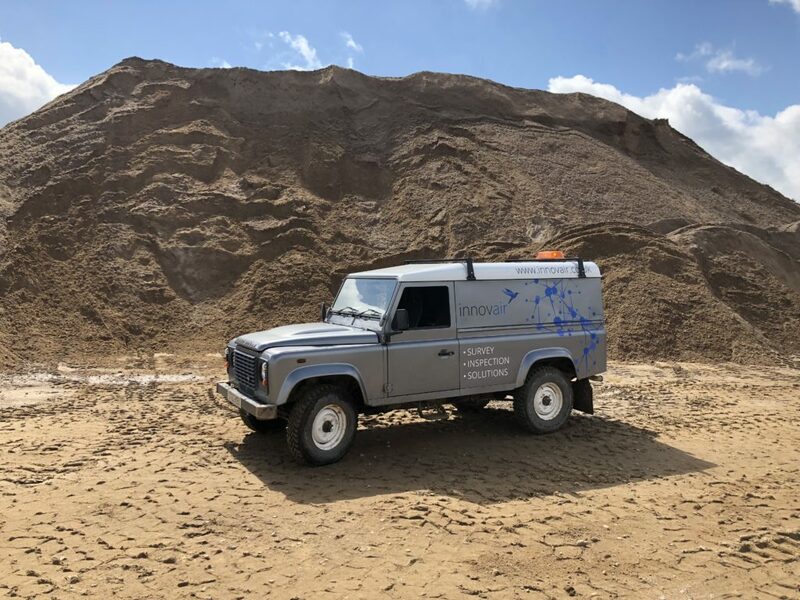 Whereas now, Innovair can provide a two-man team, a UAV pilot and land surveyor, and survey the whole quarry in one day, with an internal accuracy of +/-20mm and absolute accuracy of +/-50mm. Not only saving on manpower, it is also far less time consuming, and the data that we collect is invaluable to us as a company. With our technology, we are able to create solutions that provide our customers with the ability to make fast, effective decisions in relation to their high-value assets. That results in operational efficiencies and reduced human health and safety risk through total data capture and repeatable, measurable data. What data and results have you achieved using the M210? Using the M210 we can utilise various sensors from FLIR, high zoom camera, and the DJI Zenmuse range which we use for taking high-quality images for survey purposes. The addition of high-quality thermal imagery has taken our data capturing capabilities to the next level. There is also then the option of using Pix4D to create 3D maps, which is an incredibly useful tool, and produces invaluable data for our clients. By uploading data into our client portal we are able to present and analyse data using various tools found in the software. The client portal provides a fully automatic workflow for data analysis. From volumetric calculations in stockpiles to annotating heat loss from a facility, we can, therefore, present data for numerous applications. How has the M210 helped your businesses efficiency and cost saving? The battery life on M210 systems are amazing and its design is absolutely faultless. Having the additional battery redundancy, allows you to fly longer and survey larger sections, and thus saves time because you can complete more than one survey in one flight without having to constantly charge the batteries between flights. 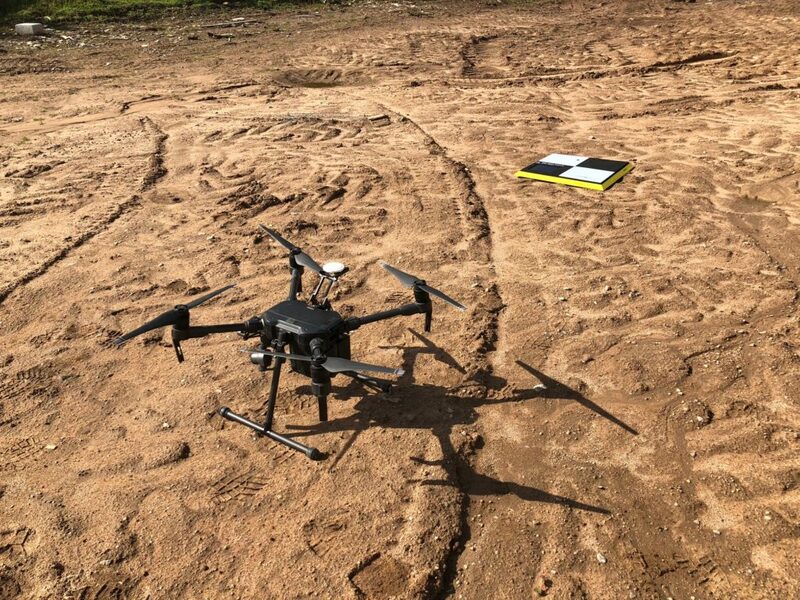 We have found that although fixed wing systems are great for covering larger locations, there isn’t always suitable landing areas in remote locations like a quarry. Whereas with the M210, you can rest assured that your drone is safe during the landing process. The M210 is also a much more stable platform than we’ve used in the past which allows us to fly and work in various weather conditions. It has an IP43 rating which means it is capable of coping with high winds and extreme weather conditions. What are your plans moving forward using the M210? The enterprise design feature of the M210 means we can use a variety of sensors available on the market. There are many issues in various industries where we feel that the M210 could assist. We also have a few developments that will be released in the near future. These developments will see our use of the M210 for surveying and filming increase. How has the M210 enhanced your surveying and filming capabilities? Depending on the application and environment there is not one UAV / sensor out there that covers all bases. However, the M210 allows us to adapt to most situations and still provide the best quality output for our clients. We give our customers repeatable, total data capture which ensures that they can mitigate health and safety issues. It also allows us to manage more efficient operations and save time and money. There aren’t many drones out there that are as effective as the M210. Its dual payload capability allows you to not only have normal vision, but also thermal vision. This is invaluable for surveying work. Finally, what made you choose COPTRZ as your drone strategy partners? COPTRZ has provided us with several systems now and if we were in the market for more systems then I wouldn’t look anywhere else. Their knowledge, support and friendly approach means we will continue to have a successful relationship for many years to come. 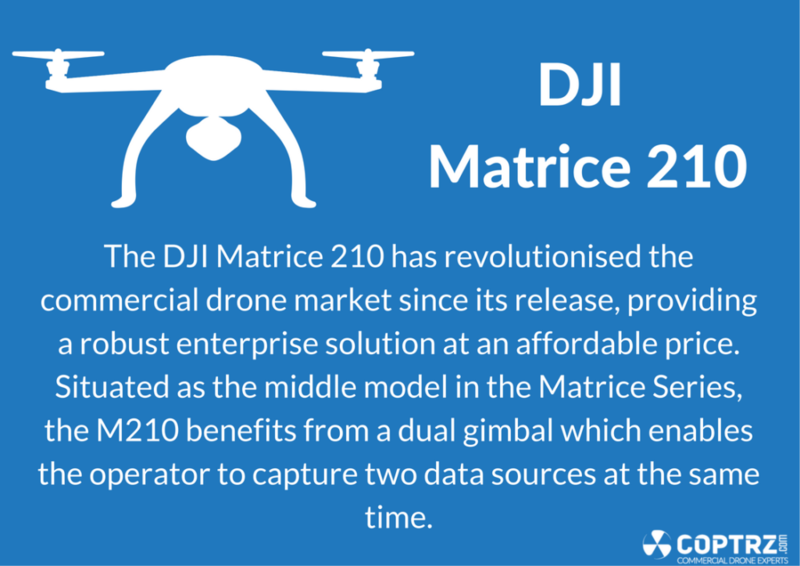 Are you interested in finding out more about the M210 and how it can benefit your commercial drone business? If so, then feel free to give the COPTRZ team a call on 0330 111 7177. Alternatively, email us at info@coptrz.com. We will be more than happy to offer you any advice that you may need.